(Newser) – In a move Leonardo da Vinci would definitely think is pretty cool, 150 students and volunteers will be using one of the Renaissance master's old designs to create the world's longest ice bridge, Discovery News reports. Construction on the project—helmed by Eindhoven University of Technology in the Netherlands—started Monday, and the 213-foot-long bridge is scheduled to be completed Feb. 13. 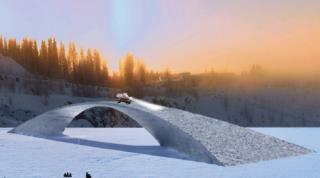 The team is using da Vinci's 500-year-old plans for a never-built bridge in Turkey. "The ice bridge has the same construction principle as that of da Vinci’s: The only load on the whole structure is compression," according to a university press release. Once the bridge is completed, it is expected to be strong enough to hold a 2-ton car. It will be used by pedestrians until the ice melts. "It will be used by pedestrians until . . . " somebody falls through to his or her death because the ice has melted in spots. The trickiest part will be finding pedestrians in the middle of nowhere.